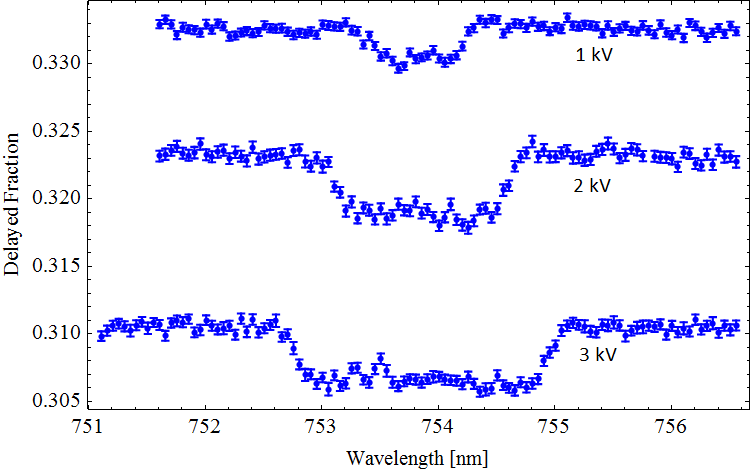 We have recently produced Rydberg positronium atoms in a two step excitation process, using 243 nm light from our broad band pulsed dye laser to excite 2P states, as in our previous Ps spectroscopy measurements. 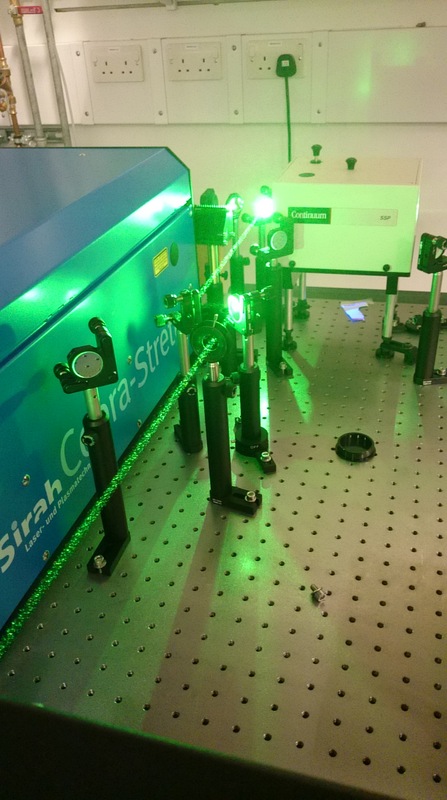 Then, instead of photoionizing with 532 nm light, we used ~ 750 nm light to excite 2p-nd transitions. This process is shown in the energy level diagram below, you can also see a photograph of the green light produced by our Nd:YAG laser pumping the infra red laser. Once the Ps atoms have been excited to a Rydberg state, their lifetime is greatly increased, and they only annihilate once they collide with the vacuum chamber. This leads to a reduced delayed fraction in our positronium SSPALS signal, since there are less gamma ray events occurring on our delayed detection time (to read more about how we detect Ps, read here). This can be seen in our data below where we excited Ps atoms to n = 11. When atoms are subjected to a high electric field different states are separated and shifted leading to an overall broadening of the spectral line, this effect is known as Stark broadening, the mixing and shifting of the states is proportional to the strength of the electric field being applied. We are able to observe this effect by varying the voltage applied to our porous silica target from which Ps atoms are produced, and therefore changing the electric field that the Ps atoms are subjected to. 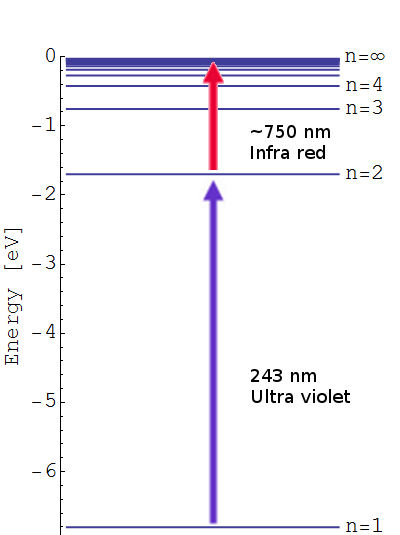 As the voltage is increased, the broadening grows with the eclectic field, thus producing a signal over a wider range of infra red wavelengths, this is shown in the figure above where we plot the delayed fraction over a range of 5.6 nm, changing the voltage applied to our target from from 1 kV to 2 kV and 3 kV.